Civilized Beasts, Poetry Anthology, 2015 Edition, editor-in-chief Laura Govednik. Manvil, TX, Weasel Press, December 2015, trade paperback $8.99 (86 pages), Kindle $2.99. This small, slim volume has four Editors and an Editor-In-Chief. Editor Jason Huitt (Lunostophiles) explains in his Foreword that poetry has an image problem; that it “is hard to sell to the masses.” (The other three Editors are Altivo Overo, Televassi, and George Squares.) I agree with his reason that it has a cultural stereotype of being ‘for the elite’. I would also say that it’s too short and plotless. 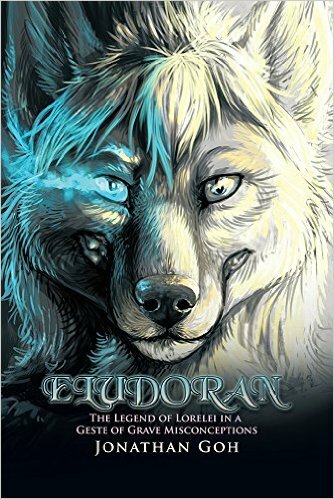 Eludoran: The Legend of Lorelei in a Geste of Grave Misconceptions, by Jonathan Goh. Illustrated, map, by Anya Ewing. Singapore, Partridge Publishing, December 2014, hardcover $48.38 (877 pages); Bloomington, IN, Xlibris, February 2015, trade paperback $32.25 (868 [+ 1] pages), Kindle $3.99.